The Julian Price house at 301 Fisher Park Circle in Greensboro has undergone a major rejuvenation since January 2017 when it and the previous owner were featured in an episode of the TV reality series “Hoarders.” And more needs to be done, according to its new owners, Michael and Eric Fuko-Rizzo. “This house requires millions of dollars of work,” Michael Fuko-Rizzo says. See a trailer for the show with this article at greensboro.com. 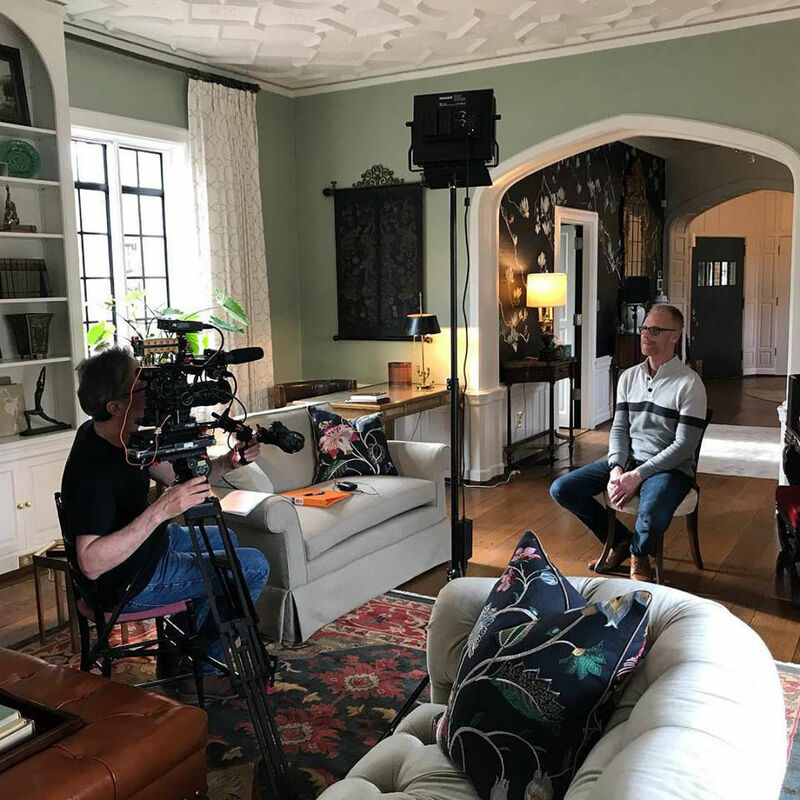 The A&E Network interviewed Michael Fuko-Rizzo, who owns the historic Price house with Eric Fuko-Rizzo, in March for the “Hoarders Overload” episode to be shown at 8 p.m. today. The two-hour "Hoarders Overload" segment of the reality television series will update viewers on Sandra Cowart, former owner of the 90-year-old mansion at 301 Fisher Park Circle who lost the property to foreclosure. It also will show the major rejuvenation of the house and its 1.6 acres under new owners Michael and Eric Fuko-Rizzo. For years, its beauty was hidden under overgrown foliage and clutter that Cowart had accumulated. When the original "Hoarders" episode aired in January 2017, more than 1.2 million households watched the drama unfold as crews emptied the house. The episode has aired several times since. Michael Fuko-Rizzo expressed gratitude to A&E for returning. "There has been so much interest in how Sandra is doing," he said. Cowart lives in the area, he said, declining to say more. Episodes of "Hoarders Overload" often present expanded versions of past episodes with previously unseen footage and updates on the subjects. The new episode, which premieres at 8 p.m., includes interviews with one of Cowart’s brothers and the new homeowners, revealing Cowart's progress and the restoration of the mansion, according to A&E. "We're excited to share this next chapter," Michael Fuko-Rizzo said. Over the next several weeks, the Fuko-Rizzos plan to move into part of the 31-room home with their 4-year-old twin daughters. The rest will be available for short-term rentals by individuals, families or groups. They can rent as little as one room — or much more. "People are excited to get the opportunity to stay here, and so we’re excited to share it with them," Michael Fuko-Rizzo said. Known as Hillside, this brick and half-timbered mansion was built in 1929 for the president of Jefferson Standard Life Insurance Co. It later served as the manse for nearby First Presbyterian Church. Hillside remains one of North Carolina's grandest Tudor Revival-style homes. It's listed on the National Register of Historic Places and Guilford County's list of historically significant properties. Its recent history has taken unexpected twists and turns. "It’s been an exciting journey and we’re excited for the next chapter," Michael Fuko-Rizzo said. Cheryl Luckett, of Dwell By Cheryl, decorated the Master Dressing Room/Master Closet for the Designer Showhouse reveal at the Julian Price House, on Friday, April 6, 2018, in Greensboro, N.C.
Laura Mensch and Gina Hicks, of Vivid Interiors, decorated the Guest Room for the Designer Showhouse reveal at the Julian Price House, on Friday, April 6, 2018, in Greensboro, N.C.
Audrey Margarite of Bunny Williams Homes, decorated the Living Room for the Designer Showhouse reveal at the Julian Price House, on Friday, April 6, 2018, in Greensboro, N.C.
Leigh Jones, of The Very Thing, Ltd., decorated the Master Bedroom with embroidered pillows with letters for Fuko-Rizzo, for the Designer Showhouse reveal at the Julian Price House, on Friday, April 6, 2018, in Greensboro, N.C.
Amanda Kinney, of High Point Antiques Design Center, decorated the Veranda for the Designer Showhouse reveal at the Julian Price House, on Friday, April 6, 2018, in Greensboro, N.C. Exterior during the Designer Showhouse reveal at the Julian Price House, on Friday, April 6, 2018, in Greensboro, N.C.
Laura Mensch and Gina Hicks, of Vivid Interiors, decorated the Guest Room bathroom around the original purple fixtures for the Designer Showhouse reveal at the Julian Price House, on Friday, April 6, 2018, in Greensboro, N.C.
Maria Money, of Maria Money Interiors, decorated the Sun Parlor for the Designer Showhouse reveal at the Julian Price House, on Friday, April 6, 2018, in Greensboro, N.C.
Kim Hoegger, of Kim Hoegger Home, decorated the Traveler's Bedroom for the Designer Showhouse reveal at the Julian Price House, on Friday, April 6, 2018, in Greensboro, N.C.
Leigh Jones, of The Very Thing, Ltd., decorated the Master Bedroom for the Designer Showhouse reveal at the Julian Price House, on Friday, April 6, 2018, in Greensboro, N.C.
Leigh Jones, of The Very Thing, Ltd., decorated the Master Bedroom with antique textiles for the Designer Showhouse reveal at the Julian Price House, on Friday, April 6, 2018, in Greensboro, N.C.
Audrey Margarite of Bunny Williams Home decorated the Living Room for the Designer Showhouse reveal at the Julian Price House. The refurbished original chandelier in the Stair Tower during the Designer Showhouse reveal at the Julian Price House, on Friday, April 6, 2018, in Greensboro, N.C. The light fixture that hangs in the stair tower had belonged to the mother of Ethel Clay Price, Julian Price’s wife. When Ethel Price’s mother died in France, the fixture came to Greensboro and was hung in the stair tower of the Price’s home. New owners Michael and Eric-Fuko-Rizzo had it restored, rewired and re-installed. The UNCG School of Interior Architecture decorated the Staff Quarters, for the Designer Showhouse reveal at the Julian Price House, on Friday, April 6, 2018, in Greensboro, N.C.
Debby Gomulka, of Debby Gomulka Designs, decorated the Dining Room for the Designer Showhouse reveal at the Julian Price House, on Friday, April 6, 2018, in Greensboro, N.C.
Owners Eric (left) and Michael Fuko-Rizzo with Robyn Branch, of Robyn Branch Design, who decorated the Tasting Room for the Designer Showhouse reveal at the Julian Price House, on Friday, April 6, 2018, in Greensboro, N.C.
Kristin Tharpe, of Parker/Tharpe, designed the Greeting Foyer for the Designer Showhouse reveal at the Julian Price House, on Friday, April 6, 2018, in Greensboro, N.C.
Michael Wimbs and Andrew Webb, of West Elm, decorated the Attic/Study for the Designer Showhouse reveal at the Julian Price House, on Friday, April 6, 2018, in Greensboro, N.C.
Jess Dauray, of Jessica Dauray Interiors, decorated the Library for the Designer Showhouse reveal at the Julian Price House, on Friday, April 6, 2018, in Greensboro, N.C.
Bobbi Jo Engleby, of Domain Interiors, decorated the Grand Foyer/Stair Tower for the Designer Showhouse reveal at the Julian Price House, on Friday, April 6, 2018, in Greensboro, N.C.
Kim Hoegger, of Kim Hoegger Home, designed the Breakfast Room for the Designer Showhouse reveal at the Julian Price House, on Friday, April 6, 2018, in Greensboro, N.C.
Laurie Lanier, of Laurie Lanier Designs, decorated the Laundry Room for the Designer Showhouse reveal at the Julian Price House, on Friday, April 6, 2018, in Greensboro, N.C.
Laura Redd, of Laura Redd Interiors, decorated the Girls Playroom for the Designer Showhouse reveal at the Julian Price House, on Friday, April 6, 2018, in Greensboro, N.C.
Maria Adams, of Maria Adams Designs, decorated the Kitchen/Pantry for the Designer Showhouse reveal at the Julian Price House, on Friday, April 6, 2018, in Greensboro, N.C. Owner Michael Fuko-Rizzo in the Breakfast Room during the Designer Showhouse reveal at the Julian Price House, on Friday, April 6, 2018, in Greensboro, N.C.
Maria Adams, of Maria Adams Designs, decorated the Kitchen for the Designer Showhouse reveal at the Julian Price House, on Friday, April 6, 2018, in Greensboro, N.C.
Bobbi Jo Engleby, of Domain Interiors, decorated the Grand Foyer/Stair Tower with a mica ceiling for the Designer Showhouse reveal at the Julian Price House, on Friday, April 6, 2018, in Greensboro, N.C.
Laura Redd, of Laura Redd Interiors, decorated the Girls Playroom bathroom for the Designer Showhouse reveal at the Julian Price House, on Friday, April 6, 2018, in Greensboro, N.C.
(From left) Tyson Howlett, Khoi Vo and Bailey Chu, from UNCG School of Interior Architecture, in the Staff Quarters area that they transformed into an in-law suite for the Designer Showhouse reveal at the Julian Price House, on Friday, April 6, 2018, in Greensboro, N.C.
Refurbished hardware on the front door during the Designer Showhouse reveal at the Julian Price House, on Friday, April 6, 2018, in Greensboro, N.C.
Hadley Quisenberry and Lisa Britt, of West Trade Interiors, decorated the Twins Bedroom for the Designer Showhouse reveal at the Julian Price House, on Friday, April 6, 2018, in Greensboro, N.C. Contact Dawn DeCwikiel-Kane at 336-373-5204 and follow @dawndkaneNR on Twitter.